Among the most popular Klondike outfitters patronized by the prospectors who went to the Yukon gold rush was Schwabacher Bros. & Company. It was at Schwabacher's dock on Seattle's Elliott bay that the steamer Portland arrived on July 17, 1897 with her "ton of gold" that electrified the world and sparked the Klondike gold rush. Soon thousands would leave that dock and others on their way to Alaska. For many years a marine landmark at the foot of Union Street, it now is a waterfront park. This pioneer Seattle merchandising business was founded by three brothers in Washington Territory in 1869, and they built an empire selling clothing, groceries, building materials and hardware. The three who eventually made their way to the territory were Abraham, Sigmund and Louis Schwabacher. They joined the thousands of emigrants who left Europe during the 19th century. Born in Germany of Jewish heritage, the young men fled to America to escape the oppression under the rule of Bismarck, prime minister of Prussia, who was know to be a violent anti-Semite. Enlisting the help of his mother’s brother, Isaac Bloch of San Francisco, Louis Schwabacher was the first to come to America. Settling in the south where he engaged in business, Louis finally settled in Mississippi. In 1858 he went to California, remaining in San Francisco until deciding to make an inspection trip to the 6-year-old Washington Territory in 1859. During this period, he sent to Germany for his brothers to join him. They soon "found themselves among indians, soldiers, settles, miners and Chinese who ran stores and grew crops for the mines." On 1 Sep 1860 the three opened their mercantile store near the northeast corner of Third and Main Streets in Walla Walla. Their business flourished, and by 1862 they had outgrown their first building. The Schwabachers had become an important part of the town’s business community. On 18 Mar, the First National Bank of Walla Walla was chartered, thus becoming the oldest national bank in the state until its sale to Seattle-First National Bank in 1947. Sigmund Schwabacher was director of the pioneer institution, and its president, Levi Ankeny, became a United States senator for Washington in 1903. Earlier, with their Walla Walla venture and obvious success, they had turned their sights to the Puget Sound region on the western side of Washington Territory. Seattle, with a population of about 1,000, expected to become a terminus of the railroad. Also, it was rapidly growing into a major shipping port and center of commerce, with small steamers serving the many logging camps and mills as well as farming communities on the Duwamish, Snohomish and Skagit rivers. For their opening, the October 1869 newspaper advertisements announced "To the Inhabitants…An Immense Attraction… Monster Opening: and a line of merchandise which not only included groceries but dry goods. The Schwabachers had opened their “new and commodious premises in Seattle … as a general store … where they trust to receive that patronage from the public which their large well-selected stock will justly merit." Seattle historian Clarence Bagley noted "the new firm had unlimited capital back of it, branch establishments at Walla Walla and Boise City and had given the managers of the central house in San Francisco clear insight into the needs of frontier communities, and the stock for the local houses was exactly suited to local demand." 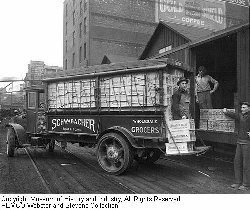 The Schwabachers built the first brick structure in Seattle, at Front Street (First Avenue South) and Yesler Way, and the company remained in business for more than 100 years. An advertisement in the Intelligencer of 25 Sep 1871 claimed the store "sold everything from a needle to an anchor." The new Seattle store was ideal for a frontier community. An 1878 Schwabacher ad reminded customers, "anticipating the wants of the public during these hard times, Schwabacher Bros. And Co. offers all kinds and classes of domestics regardless of cost…. We still give as an inducement ten per cent off for cash on Dry Goods, Clothing, Boots and Shoes." A Seattle newspaper of 1881 called the company the "leading mercantile house in the Northwest" and that it advertised "dry goods, clothing, fancy goods, hats, boots and shoes, carpets, oilcloth, groceries, liquor, paints, oils, agricultural implements, crockery, flour, feed, shingles, doors, windows, iron steel, wallpaper…. Everything a specialty, one price only, the larges stock of dry goods ever brought to any interior town." The Company even developed its own in-house labels for its goods—including "Colonial" and "Old Faithful." The 1880 Skagit River gold rush, to the north of Seattle, actually began in 1879 as word leaked out that gold had been discovered on Ruby Creek, which was a tributary of the upper Skagit River. Miners began arriving in 1880 and outfitters started laying in supplies. David Buerge in his Seattle in the 1880s, writes, "Schwabacher and Co. Put a straw-filled manikin [sic] in front of their store attired in the full kit of a well-dressed miner. On a single day, stores sold $500 worth of supplies; by April $50,000, had been grossed. In one eighty-day period in May—some 400 men left Seattle on their way to the Skagit area." The company also had opened two grist mills in Walla Walla and one on Puget Sound. The combined production of 500 barrels a day was the larges of its kind in the west. The milling business led directly to the need for a wharf and a warehouse in Seattle. Apart from its role as a docking site for the "ton of gold" carrying Portland, Schwabacher’s Wharf played and important role in Seattle’s early history for it held the city’s first customs house. Previously, Seattle businessmen had to travel cross-Sound to Port Townsend to pay import duties; now this could be done conveniently on Seattle’s waterfront. 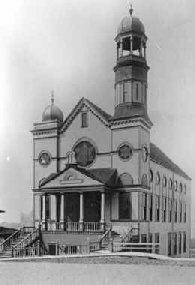 The first Schwabacher store was destroyed in the disastrous Seattle fire of 1889, as almost all of Seattle’s business district. However, the wharf was not damaged in the inferno so the business was able to reopen immediately in the wharf warehouse. Since it was the only pier to survive the fire, it became the temporary headquarters for railroad and steamship lines calling at Seattle. It also became the region’s first bonded warehouse. The first liner for Great Northern Railroad’s Orient service berthed there, inaugurating trans-Pacific service from Seattle and the city’s lucrative Orient trade. 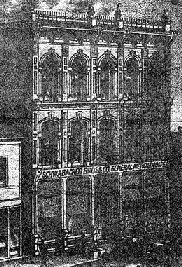 Within 16 days of the fire, a temporary one-story brick building was erected at Front and Madison Streets which served until the company’s new store was built. When the business was established, the grocery and hardware businesses were conducted under the same roof, but the Schwabacher enterprises were expanding. The extended family decided to make land investments and formed the Gatzert-Schwabacher Land Company. It owned land mainly in Seattle, but also had investments in Anacortes, Skagit Co., as well as Pierce and Jefferson Cos. Another company, the Schwabacher Realty Company, was founded. After a second fire, in the hardware department in 1893, the Schwabacher Hardware Company moved to its own building with Sigmund as its first president. Tragedy stuck again that year with the death of Gatzert. Following Gatzert’s death, the management duties fell to James S Godsmith, and then in 1901 Sigmund’s nephew-in law, Nathan Eckstein, was sent to Seattle to take over the firm’s direction. It would become the Pacific Coast Wholesale Grocery firm and Schwabacher Hardware. Later it was known as Pacific Marine Schwabacher, Inc., serving eight western states. The Seattle Times of 4 Jul 1976 claimed it was the largest wholesaler of hard goods in the Pacific Northwest.